I wanted to share a little peek of a couple of the new kits now available at the Paper Garden Projects store. These kits include the stamps! The stamps are from Eat Cake Graphics (love them) and I've collected them in sets and mounted them on indexed cling foam for you. The new kits include a CD case of stamps, patterned paper, colored and white cardstock, 5 pre-scored blank cards and envelopes, two different ribbons, and a baggie of coordinated embellishments. This first card is from the "What a Character Kit". This is Abigail - I just couldn't resist her!. You need to check out another stamp in the kit - "Feather's MacGee". That funky chicken just makes me smile! I punched the bottom edge of the card with the "Lacy Days of Summer" border punch to give the card a frilly little girl look. I just added a strip of the reverse side of the paper to the bottom of the inside of the card to highlight the lace. This is a really cute punch too - great details. 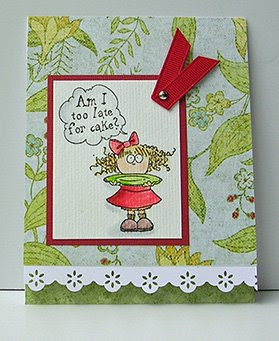 This second card was made with the "Cheery Birthday " card kit. I love the bright summer colors. Check out the other images in this set too. The Birthday cake is so funny with the - I don't know - 100? candles on it. I adore the little girl with the plate. 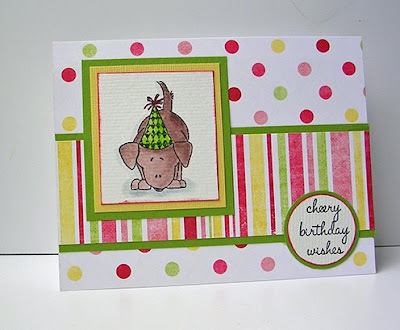 Wonderful color scheme to show off a super cute stamp! what cute cards! Love the cake one! Fun!! !